Sure, I mean, why not? 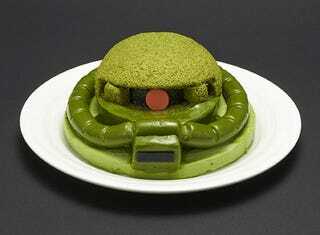 Because this is green tea flavored cake modeled after the MS-06 Zaku II mobile suit. It's not the first Zaku Gundam cake from Bandai, and it probably won't be the last. The sponge cake is made with of coffee flavored mousse layered on a green tea mousse. The Beam Saber is used to cut the cake. Just don't forget to add the chocolate monoeye before eating! Priced at 4,800 yen (US$45), the cake will be delivered in mid-December. Just in time to celebrate the holidays.